Measuring floor flatness is an essential element of any large-scale construction project. And until recently, manually producing Floor Flatness Reports was a process that could last anywhere from a few hours to a few days. Now, with the Trimble TX6 3D Laser Scanner and RealWorks software, high-resolution Floor Flatness Reports that meet ASTM E1155 standards can be produced in just a matter of minutes, saving valuable time. Our TX6 scanner delivers state-of-the-art speed and unmatched precision that make the dream of fast and accurate Floor Flatness Reports a reality. The Trimble® RealWorks point cloud modeling software enables construction professionals to register, visualize, manipulate and analyze as-built data collected from their Trimble TX6 3D laser scanners. 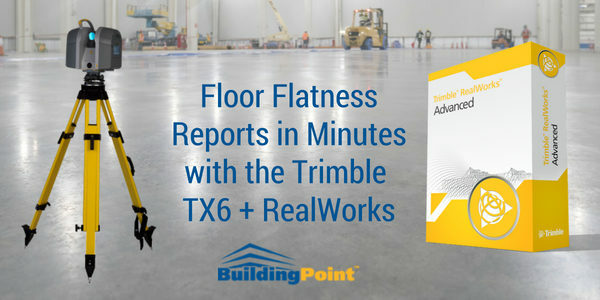 When it comes to mandatory Floor Flatness Reports, RealWorks delivers industry-standard ASTM E1155 reporting criteria to easily view actual flatness. RealWorks Floor Flatness Reports quickly output a common language that speeds the identification of intolerance and out of tolerance areas, highlighting them according to specific requirements. Create Floor Flatness Reports in minutes! Contact BuildingPoint Midwest & Gulf Coast today to request a free demonstration of the Trimble TX6 3D Laser Scanner & Realworks.